Wiggle around your neighbourhood on the Wiggle Car in Blue. Kids can harness the power of the wiggle to propel this cute and colourful ride on—just hop on and start wiggling! The self-powered Wiggle Car in Blue requires no batteries or pedals, using gravity and centrifugal force to move forward when the rider twists back and forth. Simply twist the butterfly steering wheel left and right to propel the car forward using natural momentum. The six wiggle-motion wheels provide kids with a smooth ride and the steering is super responsive. 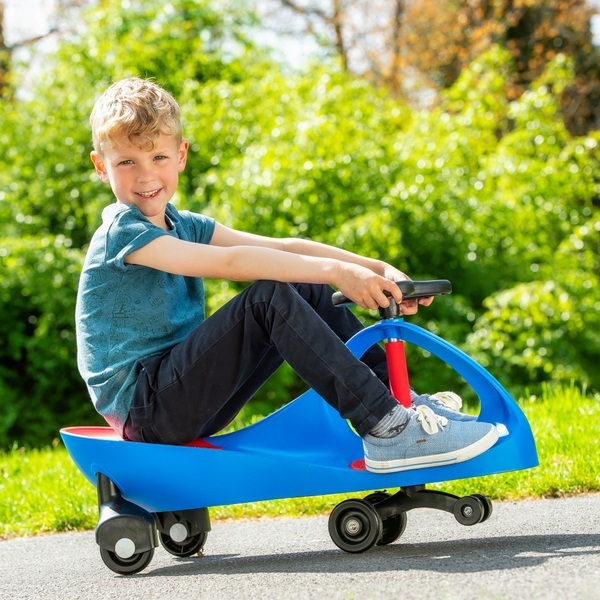 The Wiggle Car in Blue is built from high density ABS plastic, making this one sturdy ride on. Light and durable, the Wiggle Car features a seat large enough to keep kids wiggling for years to come. It even accommodates weights up to 100kg, depending on the surface type. Textured footrests provide the rider with a firm grip to keep kids secure when they get their wiggle on. This streamlined ride on features clean, modern lines and sits low to the groun to optimise wiggling fun.